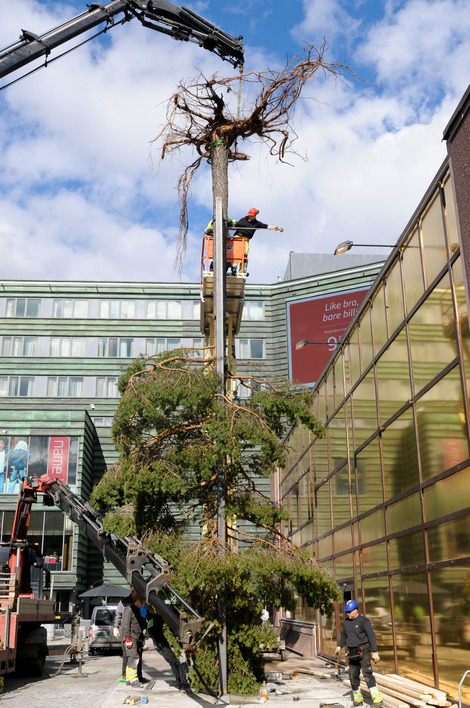 For the art project Rotvälta a great fir tree is uprooted and placed upside down in front of Oslo S. Through this dramatic event the tree becomes a symbol of our own, and the world´s, vulnerability today. When a tree falls, strong forces are set in motion. An old tree that has lived for a generations can be struck down when storms are harsh, fall to the ground with its roots bare. The brutal fall brings with it the beginning of something new; insects and fungi will dwell in the tree´s trunk, and decomposing, it nourishes the the forest floor. Both upright and laying down the three is a kind of micro cosmos. Just think of all the generations of ants that have crawled around inside it! 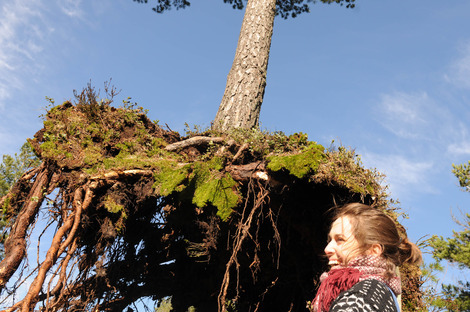 New scientific findings show that trees communicate with each other. They can remember things that have happened to them and act compassionately towards other trees of all kinds. Harmonic sound waves affect their growth, and they emit electrical impulses that can be compared to human nerve signals. 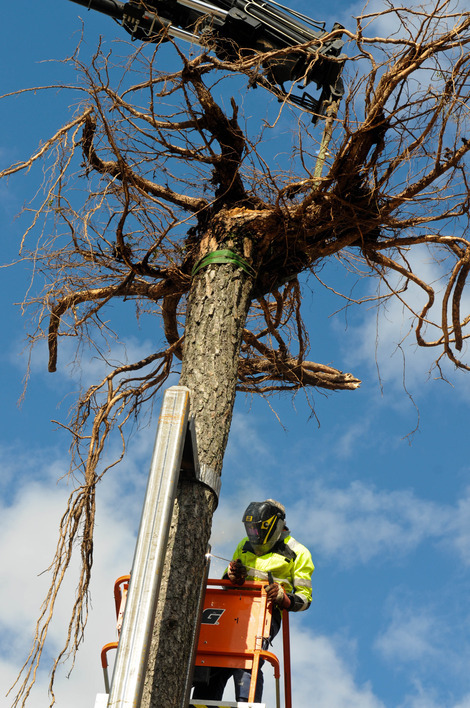 We have had a close relationship with trees and forests all through our history. They have inspired our folktales and provided us with building materials. Where would we be without them? Rotvälta seems to defy gravity. 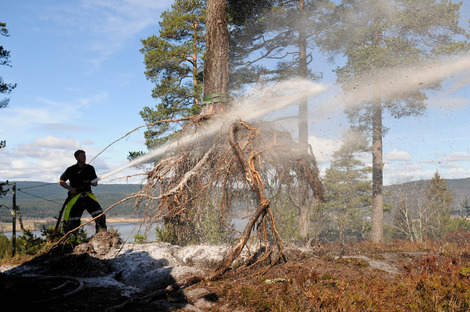 The fir tree, which has looked out over Solemskogen for over a hundred years, is violently torn up and transported like a fallen giant on an urban funeral process from the woods to Oslo S, where it is mounted with its roots upward. This is what it can feel like! Just like trees, we too need to have our feet on the ground. Without gravity our bodies won´t function, our muscles are weakened and our balance disturbed. If we are not mentally grounded we lose our balance and collapse. Yet, sometimes a storm that disrupts the foundation is necessary for us to move forward. In her drawings and installations Sandra Norrbin works with contrasts like control/collapse, structure/breakdown, open/closed. She is renowned for her monumental artistic language and use of recognizable materials in unexpected scales and surroundings. She pushes the material to its utmost boundary, whether it is 3000 square feet of isolation material, an inflatable rubber boat filling an entire gallery or a great fir tree placed upside down in front of Norway´s biggest railway station. Sandra Norrbin (b.1976 in Vadstena, Sweden) lives and works in Oslo. She received her education at Gerlesborgsskolan i Stockholm and Kunstakademiet i Trondheim and has held solo exhibitions at Krognoshuset (Lund), SOFT galleri (Oslo), Lautom Comtemporary (Oslo) and Galleri Verkligheten (Umeå). 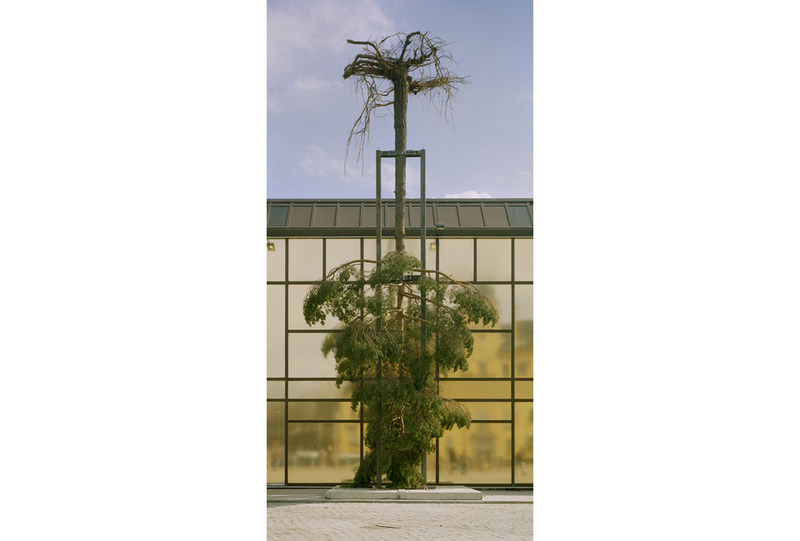 She has also participated in several group exhibitions and produced works of art for public spaces, some of them being Tøyenparken (Oslo), TEMPO (Skien) and Porsmyra kindergarten and Sverresborg school, both in Trondheim. Kulturbyrået Mesen is Project Manager for Rom for kunst. Vibeke Christensen is curator and producer of Rotvälta by artist Sandra Norbinn, at Oslo S.
Many thanks to Seksjonssjef Nordmarka Knut Johansson, Bymiljøetaten Oslo, Oslo brann- og redningsetat, Unicon Betong, VIMEK Sveisemekaniske, structural engineer Anders Lund at Høyer Finseth, Tom Gulbrandsen, Lars Sandved Dalen at NIBIO and TS Maskinutleie.